This is the heart of the DIY Kit: the 'how to do 9001' book that takes you through the process and demystifies it. This Guide is like having me as your own dedicated quality consultant beside you all the way, explaining what to do and how, and guiding you through the various stages and tasks. 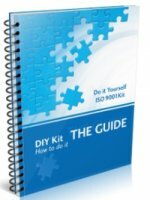 I've set out my simple, practical and effective approach in my DIY Guide, and at a fraction of what it would otherwise cost. I explain clearly how to 'do ISO 9001 certification' from start to finish. Crammed full of practical and clear advice. No weird 'ISO speak' or quality babble - by now you'll know I have no time for it. Just plain easy to read and understand English. You get the benefit of my years of ISO 9001 knowledge and experience and thousands of hours of quality audits, distilled down to only essential stuff. The toolbox gives you the templates and 'tools' to get ISO 9001 with a simple, practical and effective quality system. HR templates for job descriptions, induction, performance evaluation. 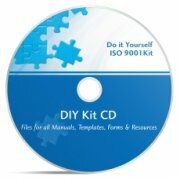 All templates are supplied in hard-copy (the Toolbox folder) as well as editable files on the DIY Kit CD. Three examples of how to usefully document an ISO 9001 quality management system. Because seeing good examples makes things quick and is an excellent way to learn. A full set of documents for ACME, including copies of their evidence/records - all the DIY Kit templates listed above with indicative contents filled in, so you can see how the written information (evidence, records, etc) might look and the templates in use. A very streamlined and simple example for a small business: Holts Motor Repairs. Shows you how to 'do ISO' very simply with very minimum documents, in a small business with skilled tradespeople. Because the last thing they need or want is reams of wordy procedures. A set of documents for Browns Manufacturing, to see how and where documents for a more traditional manufacturing company may look. The examples show and teach you how 'documenting your information' can be easy, practical and straightforward (rather than painfully incomprehensible, complicated or wordy). The Acme model is suitable for service-based and project-based companies. Holts will work well in any small business doing specialised technical services (motor repairs in their case). For manufacturing or product-based, use the Browns' Manufacturing set. Others can be added on request: for example, if your business involves distribution, ask for the Blueton Distributors Manual to be included in your Kit. Yes, the 'documented information' requirements have changed but you still need some documentation of your system. These examples will show you three models - choose the one you prefer, which should help your business operate better, and also provide confidence to prospective clients or customers. Learn what the Standard is, what it actually says and means, and train others with these resources. Transition Kit - upgrading to the 2015 Standard from an earlier one. Downloadable files - get started immediately. Regular check-ins via email to keep you on track, and help you progress. Hand-holding: have a question? Need an opinion? Ask me via email or phone and get priority response. Having my experience and knowledge available to you virtually on tap is almost worth the price of the Kit by itself! I work with a limited number of clients (by choice) these days, so buying the Kit gives you a fast pass to the top of the queue. 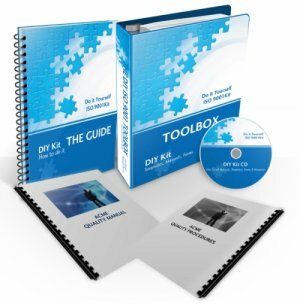 Get my feedback on the results of your Gap Analysis - included with your purchase of the DIY Kit. This is an extremely high value service, worth at least $550 alone. Suggestions for task priorities and order. Please note: if demand is too high, I may need to suspend or withdraw the offer at any time. Act now so you don't miss out. With each DIY ISO 9001 kit, you will also receive this bonus. Tool chest of files and resources - a rich collection of tools and resources, with a wealth of materials to pick and choose from. Includes sample files for company handbooks, HR handbook, over 20 job descriptions, induction checklists to project management plans, file-naming standard and a management review matrix. 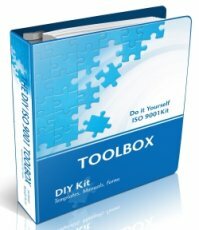 Get your DIY ISO 9001 Kit now and get started right away, with immediate access to the private website and files for download.